Robin Heintz Anderson’s Home of the Week in Harwood. Originally published in print in the Evening Capitol. During the jaunt to the Harwood family home of Robin Heintz Anderson, it feels like an adventure awaits around the next woodland corner. Pulling up to what appears to be the front door of the main house, we’re not sure where to look first. There is an antique horse-drawn, open air carriage — sort of a long-ago pick-up truck. And, a prominent duck crossing sign. Dusty is cantering about a fenced-in area. The half-Arab, half-quarter horse is followed by 8-year-olds Pixie the goat and Rosie the sheep. They’re all show biz critters: Dusty does double-duty as a unicorn during the Maryland Faerie Festival in Darlington, (www.marylandfaeriefestival.org), while Pixie and Rose have done cameo appearances on the Animal Planet TV network. 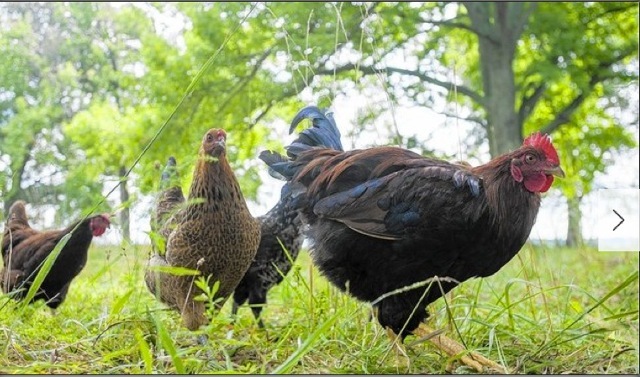 Chickens roam their land on the grounds of Robin Heintz Anderson’s Home of the Week, and bed and breakfast, in Harwood. Fluttering around outside their enclosure is one of the nine chickens. When she sees us approaching, the chicken flies over a fence into safe territory. The fowl are enjoying their sunshine. At dusk, they get herded and locked into the henhouse. A solar-powered timer reopens the door at sunrise. The hens lay eggs in hues of cinnamon, pale browns and blues. Off to the left, beyond a small barn, is a long dock, stretching into the West River. Lying in the water, next to the pier, are nine flats, each containing 750 oysters. For several years, the family raises the bivalves, which filter the nearby water. Then, the home’s residents and guests eat them and start anew with a fresh set of spat. On the other side of the house, a large in-ground pool invitingly glistens. Along the wide waterfront are a couple outdoor sets of tables and chairs. The view is worth a long drink. 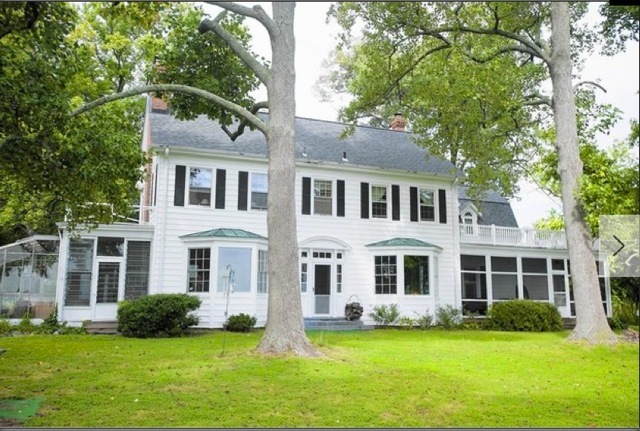 The 13-acre property has a long, curved waterfront overlooking the mouth of the West River and the Chesapeake Bay. Far across the water is the Eastern Shore. Closer in and to the right is the Galesville shoreline. There’s a front door. It’s facing the water. “When the house was built in 1921, the only way to reach the house was by water,” said Robin Heintz Anderson. She is the caretaker of the property and residence owned by her mother Shirley Heintz, who lives in a nearby house. The five-bedroom, three-bath house was built by the late Charles Carroll Glover, president of Riggs Bank in the late 1800s. He was involved in the establishment of the National Zoo and Rock Creek Park in Washington, D.C. His land holdings included most of what is now Chevy Chase. The house, on what was then a property of more than 200-acres, was intended as a summer cottage with views of Galesville, Tenthouse and Popham creeks, the West River and the Chesapeake Bay. Today, it is often used as a film location by The Weather Channel. Yet, Glover’s wife wasn’t impressed with the rural property. Livestock apparently wandered the grounds. Glover had fencing put up around the house, but that failed to satisfy her. She decided it was too remote, too far away from D.C. society. For a while, it served as a retreat house for an order of nuns. Anderson’s grandfather, William Heintz, had watched from afar as the house was being constructed and occasionally hunted squirrels on the property. He had sailed to Galesville aboard the steamboat Emma Giles in the early part of the 20th century and raised his family in the small bay-side town. In the 1940s, after Glover’s death in 1936, his estate was broken into five to seven-acre lots and sold off. Heintz purchased the 13-acre parcel containing the main house, and in 1946 put his own touches on the residence, including the addition of a glass and steel greenhouse. His wife, May Heintz, loved the place. The couple won numerous awards in sailboat races on the nearby waters. Heintz also turned the third floor servants’ quarters into extra bedrooms for his growing family. When his daughter-in-law Shirley Heintz arrived at the property years later, she was startled. William Heintz made a few changes to the house. He made the entry on the rear of the house the main entry as it faced the road — cars had replaced boats as the major mode of transportation. He removed the main floor’s pocket doors — what ironically is a major trend today had gone out of style then. The kitchen was reconfigured. A hall doorway was closed off and a corner cabinet or bowfat, also known as a buffet, was moved from the kitchen and placed in a dining room corner. The house has been the site of fires in the kitchen and living room. The most recent fire, Feb. 19, 2011, was a two-alarm blaze that brought fire equipment from Annapolis, Waugh Chapel, West Annapolis, Galesville, Woodland Beach, Harwood, Jones Road, North Beach and Upper Marlboro to the scene. The equipment formed nearly a mile-long string down the roadway. Since no hydrants were in the area, a fire boat motored to the site. It was 14 months before the house passed inspection and its residents could return. During that period, more subtle changes were made to the house. The floors were refinished throughout the house. All the walls received a new coat of paint. A second door to the upstairs porch was added. In the kitchen, three layers of linoleum were peeled away to reveal the heart of pine flooring. The original butler’s pantry, which had been turned into a laundry room, was restored. What the fire didn’t destroy were the periodic, inexplicable appearances of ghostly apparitions. Some say a mysterious white dog has been spotted scooting in and out of upstairs rooms. Pictures drop off walls and mantels, even when no wind is stirring, nor any windows open. A grandfather clock will suddenly start chiming. A vintage music box began blaring three days after its original owner passed away. Visitors have spotted an elderly woman, who resembles William Heintz’s sister Lily, sitting in a room. During a taping of A&E’s pilot episode of its series, “Possessed,” the production staff realized a volume of Fyodor Dostoyevsky’s “The Possessed” had been taken from the shelf of the home’s library and placed prominently on an end table. Next to a vintage rotary phone. A medium called in by the family heard children playing in a hidden room behind a closet — the Heintz family had not disclosed the old crawl space to the medium before her surprising pronouncement. Despite — or because of — the home’s history, it is a popular B & B, known as Bayfields Bed & Breakfast, with Airbnb, (http://www.Bayfields.org). Robin Heintz Anderson is the innkeeper. 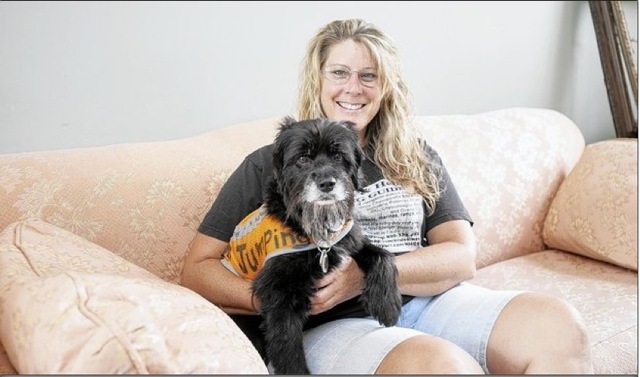 Robin Heintz Anderson, with her dog Petey, in her Home of the Week, and bed and breakfast, in Harwood. From the roadside doorway, one can look straight down the hallway to the waterside doorway. The handsome wooden staircase, which spirals upward to the third floor, faces the water. To the right is the dining room, kitchen, and the greenhouse. On the left is the living room, a library and a screened-in covered porch. In the library are vintage photos of the Emma Giles, family sailboats and an ancestor, George Heintz Jr., a fencing champion in the late 19th century. Mounted on wooden plaques are half-models of favorite sailing vessels. The floor-to-ceiling bookshelves contain at least two sets of vintage encyclopedias. Remember those? Plus, a lot of tempting, classic novels. Anderson noted the older books survived the fire with the least amount of damage, just a hint of smokiness when one thumbs through the pages. During the post-fire renovations, workers uncovered a brick flue in the library, on the reverse side of the living room fireplace. Anderson insisted it be left uncovered, giving the room a less formal look. In the new bathroom adjacent to the library, Anderson maintained the vintage feel of the house. The lower walls are sheathed in white beadboard. The floors feature a basket weave tile pattern, typical of popular 1920s tile work. The enamel sink has a déjà vu look. An eye-catcher in the living room — a comfortable space — was Anderson’s collection of empty, antique wooden frames, stacked against a wall. Eerie, yet cool. A long, wide, screened in porch, reached through the living room, runs along a quarter of the home’s water side. On the opposite side of the house is the greenhouse, which, in addition to plants, has a hot tub and a cedar sauna cabinet for two. spread, piled high with pillows, and flanked by drape-laden windows, mirrors the warm, deep red color of the wood floor. On the third floor, Rapunzel is the name of one guest room, Hansel and Gretel, with two single beds, is the other. There was a wicked witch in both of those stories. But, she’s nowhere to be seen in this magical manor.